Enrico Bressan is an italian artist based in London. He works across a wide range of media such as photography, videos, minimal sculptures and multimedia installations. Bressan adapt images, objects and situations from everyday life and places them into an artistic context, often using irony and poetry. His analysis, driven by a constant questioning of the reality, involves a dialogue between opposites, such as order and chaos, life and death, truth and ambiguity, everyday and the sublime. 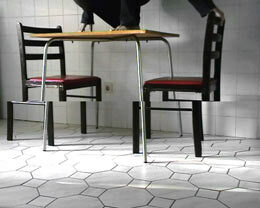 In Exercise # 49 the author makes a series of actions in order to disrupt the structure and arrangement of the only objects in the scene: a table and two chairs. It is a performative act in which the symmetries of the elements, the synchronization of the movements and balances between the parties, are continually challenged.